Jesus freak Hideout: What have you been doing since you stopped touring and recording as Code of Ethics? Barry Blaze: Well, I received a call from Spike Hogan, lead pastor of Chets Creek Church in Jacksonville FL, in 2001 to come lead worship and start a music ministry (this is also my home town). Chets Creek was a new church plant at the time and it was running about 200. There were two musicians out of that 200! *laughs* It really was a start from scratch music program but I love a challenge and Spike was a great pastor to work under. JFH: How was leading worship at your church different for you than performing with COE? Was it an adjustment at first? Barry: My first four years were team building, leading worship and on the job training! We were in an elementary school lunchroom, not much different than a large bomb shelter! Low ceiling and cinderblock walls can be a little rough for a contemporary worship band, not to mention the bright florescent lights. The stage was about a foot off the ground and we would show a lot of video back then so it was light switch on, light switch off, light switch on, you get the picture. No large stage with moving lights, which came my last year at Chets Creek when we finally moved into a building. It was a huge adjustment for me. I lived out of a suitcase for eleven years and drove or flew across the US without thinking twice; it's just what you do when you tour for a living as an artist. I quickly found myself in a very small bubble, my neighborhood, the beach and my church, and I liked it! The greatest thing about being on church staff is seeing real life change every week. I love that part about ministry, that's what keeps us going, seeing God at work in our own life and the lives of the people we love. When I was on the road you seldom had a chance to find out how someone was changed by the fact that you came to town and were the mouthpiece for God. I'm not saying I didn't see it, I can still remember the Holy Spirit moving many times. But then you climb on the bus and move on to the next town. I just experience more up close ministry in the local church and that's why I'll always have one foot in local ministry and one on the bus! With myspace, fans are contacting me now and telling me their story of how COE had a great impact on their lives spiritually. So after all this time I can see how God was working for His good even when I didn't know it. JFH: Can you tell us about the horrific motorcycle accident you suffered a few years back? How did it happen? Barry: I would really like to write a book about my experience through my eyes as well as my wife Cynthia's. I loved to ride; I just felt a freedom like no other when I would be out alone. Sometimes I would pray or just enjoy the scenery, in fact the day I had my accident I was riding back from Amelia Island, one of my favorite rides. It's an hour each way from Jax and you kind of island hop as you make your way up to this beautiful little town surrounded by water. My wife and her parents had followed me up and when it looked a little cloudy we headed back. I had stopped for gas and Cynthia's dad drove on up ahead about a half mile. It started to lightly rain just before I got out onto a very long bridge and the Holy Spirit was screaming in my ear…stop, pull over don't go on the bridge! To this day I don't know why I didn't listen but I kept going. Just as I entered the bridge it poured down in buckets of rain, lightning and the strongest side wind I've ever felt. I remember the bridge filling with water as I tried to slow down and then silence. Cynthia and her parents knew I couldn't make it through the storm and turned around. As they got to the middle of the bridge they could see cars stopping. I would have died right there from head trauma but as God would have it, the first car behind me was a fire chief and his wife, a nurse. They called for rescue and began to work on me. I needed to be air lifted to the trauma center but they couldn't get a helicopter out in the storm. So with Cynthia in the front of the rescue unit they drove me about thirty minutes to the hospital. I was unconscious until about midnight and then spent days in and out. After that came two years of surgeries, over eight in all. The crazy thing is I would still wobble on stage and lead worship not long after my accident. I just needed to feel alive! JFH: It must have been an incredible test of faith. What do you feel are some positives from this experience? How has the recovery been? Barry: I can remember when I had surgeries that overlapped and I couldn't see out of either eye….just light images, kind of like shadows. I had also lost almost all my hearing in my left ear and allot in my right from the accident. They hadn't started any repair on my ears yet because my eyes were the most crucial to stabilize. Cynthia had left the house to go to church and I've never felt more alone or frightened and vulnerable in my life. I wanted to crawl under the deepest rock and never come out. It felt like God had abandoned me. So I cried out to Him and told Him that I was at the edge and it was all I could take and that I needed to feel His presence next to me. He was there then, all through the painful surgeries and every good and bad day over the past three years. I have permanent hearing and eyesight loss but through my weakness, He is made strong! JFH: With you recording as Code of Ethics again, will you be working with anyone as a band? Barry: I'll probably write with some friends on some songs but it's very important to keep the original sound that I had started way back in the beginning. I really enjoy the whole process of writing, recording and even mixing (though I have turned that over to someone else now). The hardest thing for me is that I can't hear certain sounds anymore even with a hearing aid. Music will never sound the same for me this side of heaven unless God chooses to heal me but like I said I'm weak and He is strong. All good. JFH: Do you hope to tour again as Code of Ethics? Barry: I have an opportunity to do dates this summer as Barry the worship artist and as COE. At one point I said I would never go back on the road but I've changed my mind. I really want to get out and meet with people again. It will be very difficult physically but I think I need to do it because of the story of what God has done in my life. JFH: You've also been working on solo material and just released a solo record. What do want to pursue through the solo venture that you won't be able to do with Code? 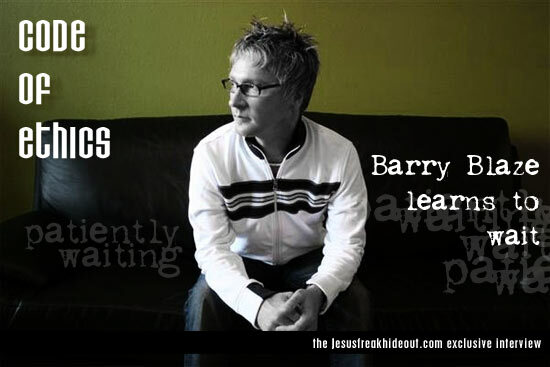 Barry: This new CD called Patiently Waiting is a worship album. A collection of songs I wrote while in the darkest and brightest times after my accident. It's also a personal triumph because I wasn't sure if I could ever make music again. God gave me the courage and endurance to be the artist He created me to be. The CD is also more organic than COE in that I didn't really program any of the songs and wrote many of them on the acoustic guitar. This will allow me to lead worship using songs from this CD in church or festivals etc. by myself or with a band. JFH: Can you tell us a bit about the album Patiently Waiting, its title, who you worked with on it and the recording process? Barry: I wrote the title song "Patiently Waiting" while on a strong steroid prescribed to help boost the healing process. One of the many side affects is a mass amount of energy and sleeplessness. I was lying in bed when God put the whole song on my heart. It was the middle of the night so I went to the other side of the house and recorded it into a boom box quietly, then went back to bed. The song became the title track because it says no matter what happens to me I'll still be here waiting to hear from God and I'll try not to complain! It sums up what I was going through at the time. I was really longing to understand why this happened and where God was taking me. I wrote and played all the instruments (except for the drums and percussion) and recorded it at Chets Creek while I was still working there. Then took it to a local studio to be mixed and mastered. Barry: To love my wife more, to love Christ's church and to appreciate every day given to me. Life is very short and it's not about the things we gather or our earthly accomplishments. It's all about eternity and doing what God designed us to do and being who He made us to be. Barry: Life has been an amazing journey for me. Eleven years touring as COE and doing what I love to do, then leading worship in the local church and now back again making music. God has given me the desire of my heart, He is strong in my weakness! Please visit BarryBlaze.com for more info as well as Myspace.com/BarryBlaze and Myspace.com/coeofficial for CDs and tour dates etc. Expect more to come from Code Of Ethics! Stay tuned to www.Myspace.com/coeofficial for the latest!